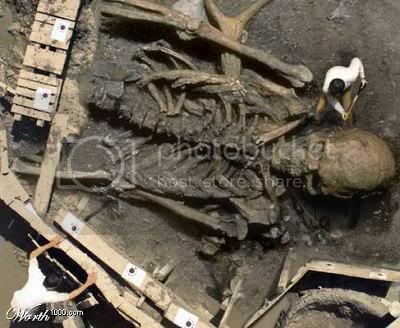 An Eighty Foot Tall Human Skeleton Discovered! Thread: An Eighty Foot Tall Human Skeleton Discovered! Is this For real!?!? Anyone heard of this? Last edited by Wolfmight; 12-17-2007 at 10:16 PM. There has been a lot of giant skeletons discovered. One over 9 foot tall. The ones here are in the U S A. Can't find confirmation that it is factual though. Last edited by bigboab; 12-17-2007 at 09:52 PM. look at the logo in the lower left hand corner, google Worth 1000 and see that it is a photoshop contest site. I thought worth1000 was a reality creator science lab. what a good shop though, damn. fooled me. except the 2nd and 3rd photos look slightly differents. maybe it's to show a different stage of uncovering though. Bummer... that would have been damn cool if it was real. So, are scientists REALLY sure that dinosaurs were once the head-honchos? I'm sure an 80 foot human could have roasted and toasted a T-Rex back in the day. I hope they won the contest though! I'm sure an 80 foot human could have roasted and toasted a T-Rex back in the day. A pitbull can take down a human despite the size difference and a T-rex is equipped with much more formidable weaponry. lol, Being a ninja with stature is next to impossible..